Punctures are rare but they can happen. Austin Sevens do not have inbuilt jacking points like modern cars and, therefore, a lot more care is required. It is possible for a couple of men to lift the corner of a 'Chummy' or 'Box' whilst a wheel is changed but the Ruby and Big Sevens are heavier, and you may be alone, so the use of a jack is required. If working in a garage or on a level forecourt use a trolley jack. Position it under the front axle or under the differential at the rear. If necessary use axle stands. If changing a wheel at the roadside and you cannot drive off the carriageway then THINK SAFETY - Hi-Viz, Warning Triangle and ask any passenger with you to be a look-out to give advance warning that the road is narrowed. CARE: Screw jacks as originally supplied with the 'Seven' are notorious for suddenly unscrewing and the car collapses on that corner, even Scissor Jacks can unscrew. Hydraulic bottle jacks have a small base and can tip as the car moves whilst being lifted. Work on a level surface whenever possible and chock either the front or back wheels as appropriate. 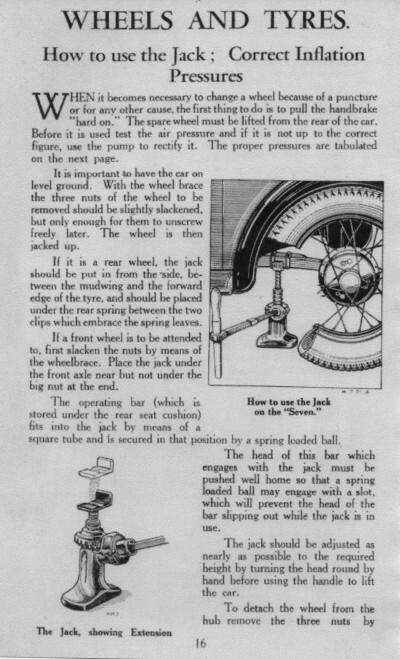 The position of the jack under the car is important. 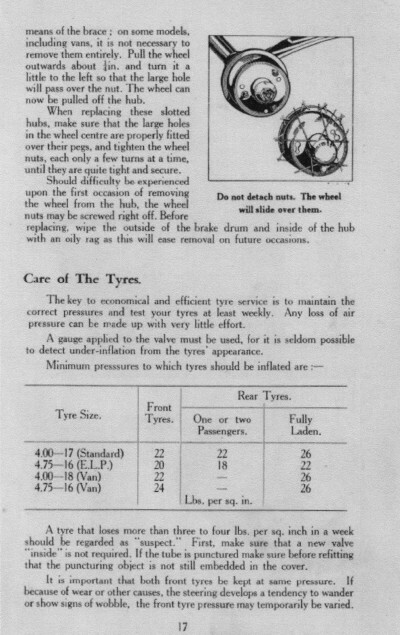 The advice in the Hanbooks changed over the years depending upon the model. 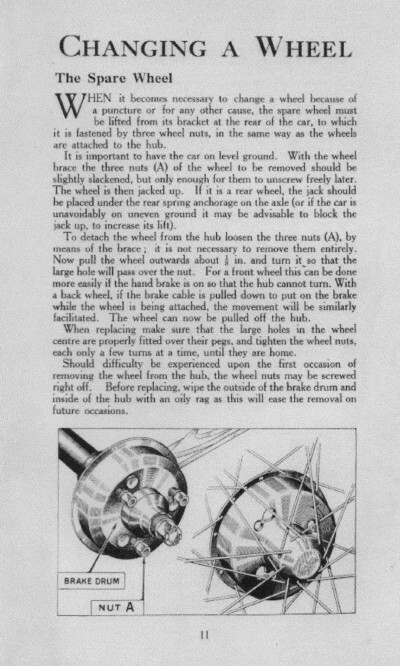 The important point of this article is the position of the jack at the front and rear of the car. Always ensure that the spare has the correct inflation.